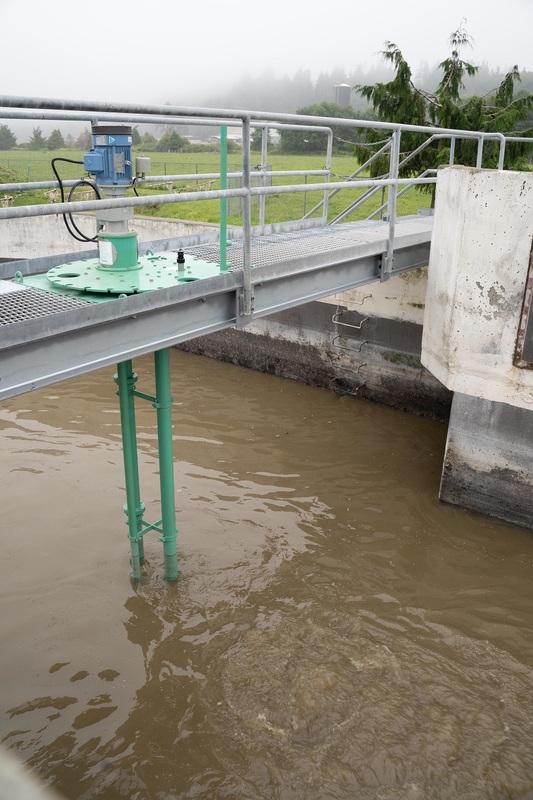 Traditional, horizontal-mounted submersible propeller mixers are at risk of fluid in-leakage. When horizontal mixers fail, replacement alternatives include vertically mounted, turbo propeller mixers. These small but powerful mixers are mounted inside an 18-inch elbow with all motor and gearbox components above fluid level and adaptable to existing guide rail systems. To increase mixing reliability and flexibility, some of these vertical propeller mixers incorporate anti-binding mechanisms. For example, the Vaughan Turbo-S mixer incorporates an upper cutter above the propeller to stop wrapping and fibrous material binding and to protect the mechanical seal. Additionally, the vertical configuration of the Turbo-S mixer allows it to mix a pit with just approximately 2 feet of liquid above the floor while an optional add-on turntable can allow the Turbo-S to be easily re-aimed in the pit. Vertically mounted turbo propeller mixers are readily implemented in primary influent channels, Bardenpho basin mixing, scum blanket mixing, and primary sludge storage mixing. To learn more about turbo charging your pit mixing, visit chopperpumps.com.